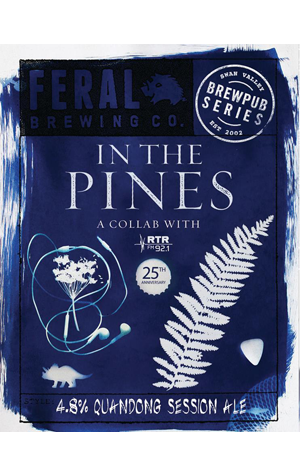 To celebrate the 25th In The Pines music festival, Perth community radio station teamed up with Feral to create a celebratory beer. Local musicians Lucky Peach and Em Burrows joined head brewer Will Irving at the Swan Valley Brewpub with the intention of creating a sessionable beer that would suit a full day underneath the Somerville Auditorium pines – but one with a local spin. With this in mind, the addition of native Aussie quandong (the second appearance of the marvellously named fruit in a beer in recent weeks) pays respect to the Derbarl Yerrigan, the original name for the Swan River beside which the fruit grows, and which flows through the indigenous land on which RTR hosts their annual festivities. The fruit imparts light peach-like characters into the Australian pale ale that work in unison with the approachable citrus and pine needle characters. In The Pines' sessionability is enhanced further by a mild bitterness and dry finish. Move fast and you'll find it on tap at select Perth venues and the Swan Valley Brewpub, where takeaway growlers are also available.